Occurrence of complications, its mechanism, management challenges, possible prevention. Case Report | Volume 5 | Issue 3 | JOCR July-Sep 2015 | Page 48-50 | Ketan Pande, Juzaily Fekry Leong, Ngai Nung Lo. DOI: 10.13107/jocr.2250-0685.306. Department of Orthopaedics, Raja Isteri Pengiran Anak Saleha Hospital, Negara Brunei, Darussalam. Clinical Specialist in Orthopaedics, RIPAS Hospital, Bandar Seri Begawan BG1710, Negara, Brunei, Darussalam. Introduction: Innovations in the design of total hip arthroplasty components have been developed to address certain limitations with the use of standard monoblock prosthesis. With increasing use and long-term follow up, certain complications particularly related to fretting, corrosion and fatigue have been recognized. Case Report: A 31 year old active male patient presented with spontaneous dissociation of the Anatomic Medullary Locking A Plus (AML A Plus) Femoral Component at head and neck interface 10 years after surgery. At revision surgery, wear of the acetabular liner and head and neck taper was noted. Definitive treatment required complete revision of the femoral component and change of acetabular liner. Conclusion: While modularity allows change of worn out components, this case highlights the importance of various factors in avoiding this complication and the need for surgeon to be prepared to use ‘taper sleeves’ or revise the components if taper exchange fails particularly in cases with dissociation of head-neck interface which is usually associated with taper damage. The total hip replacement implants have evolved over time. Modularity of implants was developed to address some of the shortcomings of the initial monoblock prosthesis to allow intraoperative adjustment of the offset, leg length, and enhance abductor muscle function. However with increasing use of these prostheses, problems like component failure due to fretting, corrosion and fatigue have been recognized . Recently Cooper et al have reported adverse local tissue reaction secondary to corrosion at the modular femoral head-neck taper similar to that noted in metal-on-metal bearings . Dissociation of modular components is a rare but a well recognized complication with the use of modular prosthesis. The dissociation may occur at the head-neck or neck-stem interface . We report a case of dissociation of the head and neck component of a modular prosthesis 10 years after surgery. At revision surgery and on retrieval of implants wear at the head and neck interface and acetabular liner was confirmed to be the cause of the dissociation. 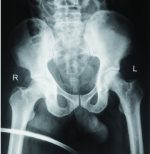 A 21 years old male underwent uncemented modular total hip arthroplasty in 2002 for secondary arthritis of the left hip. The implants used were AML A PLUS 11.0 mm femoral stem, 28 mm COCR head and DURALOC acetabular liner and shell 50 mm (Depuy Orthopaedics, Warsaw, USA). He had good outcome in terms of pain relief and restoration of function. He later started working as a Policeman. In January 2012, at the age of 31 years, he presented with acute onset pain and inability to move left hip while he was turning in bed. Plain radiograph of the hip confirmed dissociation of the components at the head and neck taper junction without dislocation (Fig 1a and b). Due to anticipated difficulties in closed reduction, open reduction was performed. It was noted that there was wear of the acetabular liner and wear at the head and neck taper. Implants were reduced and patient was advised revision of total hip prosthesis. As the facility for revision surgery was not available at our centre, he was referred to a higher centre for revision hip surgery. In April 2012, the revision surgery was performed using trochanteric osteotomy when it was noted that the acetabular shell and femoral stem were well fixed but there was failure of taper as seen by wear of the trunnion (Fig 2), which did not engage the femoral head taper, and there was wear of the acetabular liner (Fig. 3). Similar changes of wear were noted in the dissociated head component. No abnormal reaction or changes in the peri-prosthetic tissues were noted. Intra-operatively, attempts at attaching the new femoral head component with 2 different trunion changes failed, hence the full coated femoral stem was removed using proximal femur split. Femoral component was revised in full and acetabular liner was changed as the shell was well fixed. Two years after revision surgery, patient reported no pain and was ambulating without support. The extended femoral osteotomy had healed well. There was evidence of heterotopic ossification resulting in some restriction of movements (Fig. 4). Modularity of total hip replacement components allows the surgeon to restore the hip joint biomechanics to obtain improved range of motion, joint stability, soft tissue balancing, abductor strength, and leg length equality. The modularity can be at femoral head-neck interface, neck-stem interface or at both levels (dual modular). In addition to the above modularity also allows replacement of part in case of revision [1,3]. Dissociation of the modular femoral component at the head-neck interface is a rare complication and has been reported mostly in the form of case reports, during attempt at closed reduction in cases with dislocation [4-8], following trauma  or even normal activity [7,9-11]. Retrieval studies have shown that the incidence of crevice corrosion at the head and neck interface between mixed metal systems is higher at 35-40% compared to 9-28% in single alloy systems [12,13]. The degree of corrosion is less with titanium based components  but Kop et al  have reported cold welding of the components. A number of retrieval studies have confirmed corrosion at the head and neck interface particularly in mixed metal implants [2,3,12,13,15]. Various mechanisms can lead to corrosion at the head-neck taper. Crevice corrosion can result from fluid entering into a small gap between components. Fretting corrosion appears to be a major source of failure at modular junctions caused by micro-movement between the components. Galvanic corrosion can occur when fluid is present in mixed-metal components . Corrosion can lead to third body wear and surrounding tissue reaction from particulate debris . Cooper et al  have reported adverse local tissue reaction in patients with metal-on-polyethylene modular bearings similar to that reported with metal-on-metal bearing. 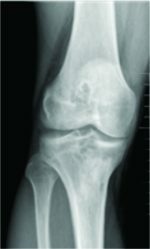 Inflammatory response resulting from products of corrosion can lead to local osteolysis, pseudotumor formation and synovitis [13,16]. Thus, corrosion can affect the mechanical integrity of the implants secondary to the above mentioned processes. A possible mechanism suggested for dissociation of the modular components is a strong distraction force at the junction when the neck flange is caught at the acetabular rim and inadequate impaction of the head on the neck taper . Lavernia et al  have suggested that the presence of debris such as blood and fat places the head-neck taper at risk of dissociation at forces lower than those required to disrupt a pristine junction. The initial strength of the head-neck assembly or taper is also determined by the impaction force at surgery . Various risk factors for corrosion at modular interfaces have been reported in the literature. Improper or asymmetric fit of the head on the Morse taper can cause accelerated corrosion and failure [13,19]. Other factors identified have been larger femoral heads, extended offset heads with a lower neck shaft angle in metal on metal components . It is also dependent on time and the mechanical stress placed on the taper [3,21]. In another retrieval study Grupp et al  have confirmed that the failure at the modular neck junction can occur due to surface micro-motion resulting from surface contamination or high loading of the implant components. Both of these processes can lead to fretting or crevice corrosion in the modular coupling. The authors also identified the risk factors for implant failure as intraoperative particle contamination, excessive loading due to patients’ weight, high activity level and male gender. In a recent review, Wassef and Schmalzried  have referred to the fretting and corrosion seen in modular femoral head-neck junction as ‘femoral taperosis’. The authors have highlighted certain factors contributing to corrosion. Large femoral heads have been increasingly used to improve range of movements and reduce chances of dislocation. Similarly the neck and taper dimensions have also been reduced. Both of these factors can contribute to corrosion. Total hip replacement in young active patients increases the stresses on the taper. In the present case multiple risk factors for corrosion and dissociation can be recognized. At surgery wear of the polyethylene acetabular liner was noted together with corrosion at the taper. The patient was young with higher activity level thereby exposing the modular prosthesis to high mechanical loading and had his primary surgery done 10 years before the dissociation. Though it is difficult to confirm or refute, human error including, intra-operative factors like surface contamination, asymmetric fit of the head may have contributed to the corrosion at the head-neck interface. The present case adds to the limited number of cases of spontaneous dissociation of a modular head-neck interface with discussion of its possible mechanism. It was observed in traditional low torque 28 mm head with similar head and neck metal composition. While modularity allows change of worn out components, this case highlights the need for surgeon to be prepared to use ‘taper sleeves’ or revise the stem if taper exchange fails particularly in cases with dissociation of head-neck interface which is usually associated with taper damage. The importance of factors like cleanliness of the taper junction, avoiding pairing of head and neck components of dissimilar metals, correct impaction and awareness of manufacturing tolerances is also stressed. In a recent study, Duwelius et al  found no difference in the clinical outcome or chance of complication between patients undergoing primary total hip replacement using modular and non-modular neck systems. Though any recommendations about use of the prosthesis cannot be made on the basis of this single case, close monitoring of trunnion and analysis of clinical results and complications with the implant should be done. With the increasing use of modular total hip prosthesis and their long term followup, arthroplasty surgeons are likely to see complications related to corrosion and wear. While these could be related to failure of implant design and / or locking systems, attention should be paid to various intra-operative factors which are known to contribute to these complications. Successful revision surgery for such cases may require partial or complete revision of one or both components or use of ‘taper sleeves’. Attention should be paid to various intra-operative factors which are known to contribute to these complications. Orthopaedic surgeons dealing with joint reconstruction should be aware of this unique problem. Meticulous attention to surgical steps can help prevent this problem. Faced with the problem, the surgeon should be prepared to revise the components in part or in toto. 1. Srinivasan A, Jung E, Levine BR: Modularity of the femoral component in total hip arthroplasty. J Am Acad Orthop Surg 2012;20:214-22. 2. Cooper HJ, Della Valle CJ, Berger RA, et al: Corrosion at the Head-Neck taper as a cause for adverse local tissue reactions after total hip arthroplasty. 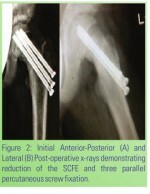 J Bone Joint Surg Am 2012;94:1-7. 3. Kop AM, Keogh C, Swarts E: Proximal component modularity in THA – at what cost? An implant retrieval study. Clin Orthop Relat Res 2012;470:1885-94. 4. Pellicci PM, Haas SB: Disassembly of a modular femoral component during closed reduction of the dislocated femoral component: A case report. J Bone Joint Surg Am. 1990;72:619-20. 5. Woolson ST, Pottorff GT: Disassembly of a modular femoral prosthesis after dislocation of the femoral component: A case report. J Bone Joint Surg Am 1990;72:624-625. 6. Star MJ, Colwell CW Jr, Donaldson WF 3rd, Walker RH: Dissociation of modular hip arthroplasty components after dislocation. A report of three cases at differing dissociation levels. Clin Orthop Relat Res 1992;278:111-5. 7. Barrack RL, Burke DW, Cook SD, Skinner HB, Harris WH: Complications related to modularity of total hip components. J Bone Joint Surg Br. 1993;75:688-92. 8. Shiga T, Mori M, Hayashida T, Fujiwara Y, Ogura T: Disassembly of a modular femoral component after femoral head prosthetic replacement. 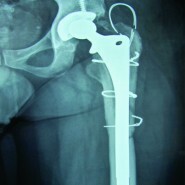 J Arthroplasty 2010;25:659.e17-9.doi: 10.1016/j.arth.2009.03.001. 9. Chu CM, Wang SJ, Lin LC: Dissociation of modular total hip arthroplasty at the femoral head-neck interface after loosening of the acetabular shell following hip dislocation. J Arthroplasty. 2001;16:806-809. 10. Karaismailoglu TN, Tomak Y, Gulman B: Late detachment modular femoral component after primary total hip replacement. Arch Orthop Trauma Surg 2001;121:481–2. 11. Talmo CT, Sharp KG, Malinowska M, Bono JV, Ward DM, LaReau J: Spontaneous modular femoral head dissociation complicating total hip arthroplasty. Orthopaedics 2014;37:e592-5. doi:10.3928/01477447-20140528-62. 12. Gilbert JL, Buckley CA, Jacobs JJ: In vivo corrosion of modular hip prosthesis components in mixed and similar metal combinations: the effect of crevice, stress, motion and alloy coupling. J Biomed Mater Res 1993;27:1533-44. 13. Goldberg JR, Gilbert JL, Jacobs JJ, Bauer TW, Paprosky W, Leurgans S: A multicenter retrieval study of the taper interfaces of modular hip prostheses. Clin Orthop Relat Res 2002;401:149-61. 14. Schramm M, Wirtz DC, Holzwarth U, Pitto RP: The Morse taper junction in modular revision hip replacement – a biomechanical and retrieval analysis. Biomed Tech (Berl) 2000;45:105-9. 15. Lieberman JR, Rimnac CM, Garvin KL, Klein RW, Salvati EA. An analysis of the head-neck taper interface in retrieved hip prostheses. Clin Orthop Relat Res 1994;300:162-7. 16. Whitehouse MR, Endo M, Masri BA. Adverse local tissue reaction associated with a modular hip hemiarthroplasty. Clin Orthop Relat Res 2013;471:4082-6. Doi:10.1007/s11999-013-3133-1. 17. Lavernia CJ, Baerga L, Barrack RL et al . : The effect of blood and fat on Morse taper disassembly forces. Am J Orthop (Belle Mead NJ) 2009;38:187-90. 18. Pennock AT, Schmidt AH, Bourgeault CA: Morse-type tapers: factors that may influence taper strength during total hip arthroplasty. J Arthroplasty 2002;17:773-8. 19. Pansard E, Fouilleron N, Dereudre G, Migaud H, Girard J: Severe corrosion after malpositioning of a metallic head over the Morse taper of a cementless hip arthroplasty. A case report. Orthop Traumatol Surg Res 2012;98:247-50. 20. Langton DJ, Sidaginamale R, Lord JK, Nargol AV, Joyce TJ. Taper junction failure in large-diameter metal-on-metal bearings. Bone Joint Res 2012;1:56-63. 21. Jacobs JJ, Gilbert JL, Urban RM. Corrosion of metal orthopaedic implants. J Bone Joint Surg Am 1998;80:268-82. 22. Grupp TM, Weik T, Bloemer W, Knaebel H. Modular titanium alloy neck adapter failures in hip replacement – failure mode analysis and influence of implant material. BMC Musculoskeletal Disorders 2010;11:3. doi:10.1186/1471-2474-11-3. 23. Wassef AJ, Schmalzried TP: Femoral taperosis: An accident waiting to happen? Bone Joint J 2013;95-B, Supple A:3-6. doi:10.1302/0301-620X.95B11.32630. 24. Duwelius PJ, Burkhart B, Carnahan C, et al: Modular versus nonmodular neck femoral implants in primary total hip arthroplasty: Which is better? Clin Orthop Relat Res 2014;472:1240-5. doi: 10.1007/s11999-013-3361-4.